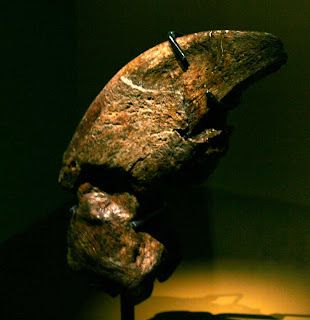 This Megalonyx jeffersonii claw is on display at the Science on the Edge: Radical Innovation in New Harmony display at the Indiana State Museum in Indianapolis. This specimen once belonged to Indiana State Geologist David Dale Owen. It was found around 1850 by Walter Alves near Henderson, Kentucky on the Ohio River shore line. If I understand correctly part of the specimen was destroyed in a fire later at a museum. The specimen shown in the picture belongs to the Indiana State Museum and is known as the Henderson Sloth. Learn more about its history on Professor Clark Kimberling's web page at the University of Evansville. 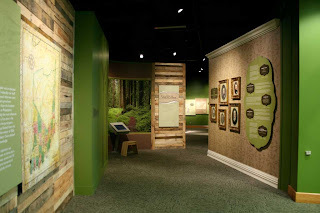 Learn more about this exhibit at my earlier post from April 2012.